Prepare a child’s table with sufficient space around it. Ask one of the older children to come demonstrate with you how to carry a table. Because the older child will know how to carry a table, this allows the other children to see the movements of the two people carrying the table. You may still want to explain to the older child that he should follow your movements. Invite 3-4 children to come participate in your lesson by telling them you have something to show them. Show each child where exactly to sit and once the children are seated, you and the older child sit so that everyone can see each other. Call their attention to the table and tell them that you are going to show them how to carry a table with the help of the older child. Stand on the side of the table so that the width of the table is directly in front of you. Show the older child where to stand (opposite you) through a gentle hand movement. Both people bend your knees. Place your right thumb down on the table so that your right palm is on the tabletop near the side right corner. Wrap your four right fingers around the base of the tabletop. Place your left thumb down on the table so that your left palm is on the tabletop near the side left corner. 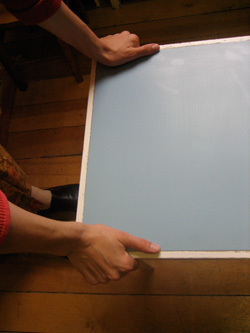 Wrap your four left fingers around the base of the tabletop. Have the older child to exactly what you have just done. As both straighten their knees, bring the table slightly up off the ground. Have one person move backwards and one person move forwards. Check constantly for obstructions in the walkway. One person carefully places one leg of the table down first. The same person places the other leg of the table down silently. The other person now places the two remaining legs down. Unwrap your left four fingers from under the tabletop. Lift your left thumb and palm from on top of the tabletop. Unwrap your four right fingers from under the tabletop. Lift your right thumb and palm from on to of the tabletop. Offer each child the opportunity to pick up and carry the table with you. Direct: Growth in independence with regard to the performance of the movements necessary for the carrying and placing of the table without damaging himself, others, or the table. Indirect: Coordination of the child’s movement, development of the muscles, and concentration. Lifting at different levels based of the other person’s height. The hand you begin with (above I use the right hand) needs to be more specifically the hand furthest away from the seated children.When lifting the table, only lift up to the level the smallest person is lifting to.